BVB Training Jersey – Sleeveless – Yellow. Games are not won on the pitch, but on the training ground. With PUMA’s Licensed Club Teamwear Collection which provides comfort and support to the athlete, results can and will be achieved. 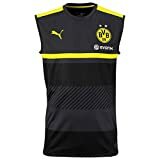 Fans can show their support for their favourite club in style when they wear this sleeveless BVB Training Jersey which features Heat Transfer Cats and the Official Woven Club Badge. This entry was posted in Soccer and tagged Borussia, Dortmund, Mens, Puma, TShirt by FPSports. Bookmark the permalink.